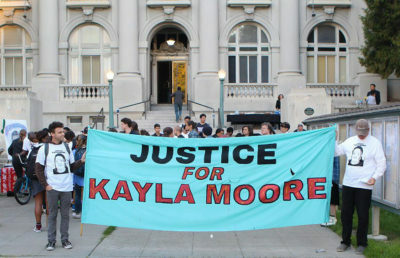 About 50 supporters gathered in front of Berkeley City Hall on Tuesday night to honor the life of Kayla Moore — a Black transgender woman diagnosed with schizophrenia who died in Berkeley police custody in 2013 — and march for police reform. Moore’s father filed a lawsuit against the city alleging wrongful death in 2014, and a pretrial hearing for the case is scheduled for Oct. 18. Supporters at the march created a shrine on the steps of City Hall filled with electric candles, photos and handwritten messages in memory of Moore. Boona Cheema, a JFKMC member, march organizer and 47-year Berkeley resident with more than 40 years of experience as a mental illness social worker, said the march was planned to gain support for Moore before the upcoming hearing. The marchers paused on Allston Way to speak in front of the Gaia apartments — Moore’s prior residence and where she died in police custody. Alex Li, a campus sophomore and Copwatch member, said Copwatch veterans have fought for Moore in the coalition since 2013. 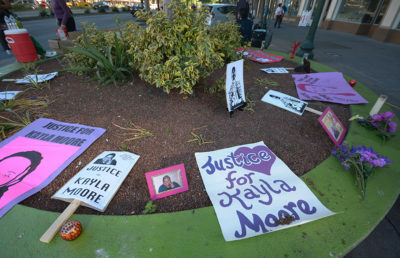 Maria Moore, Kayla’s sister, said there is a lack of mental health services in Berkeley and that it took Kayla two months to get an appointment with a psychiatrist at Berkeley Mental Health after moving to the city. 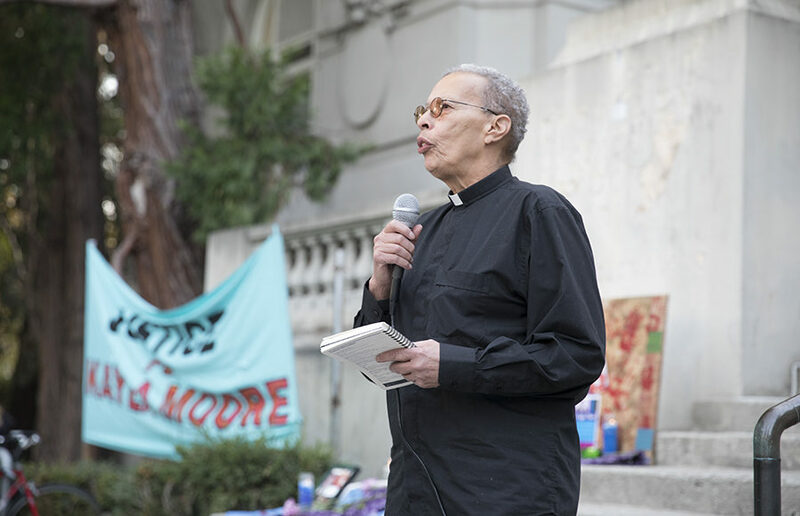 Leroy Moore, a Berkeley resident with cerebral palsy who has no relation to Moore, has been a mental disability and police brutality activist since the 1980s. According to Leroy Moore, the handling of mental health crises has not improved since he started being an activist. “Police training is not the answer. Defund the police so we can train our own community,” Leroy Moore said. Moni Law, a campus alumnus, came to the march as a concerned community member. Law said she believed that the training police receive to handle mental health crises is inadequate and that all cases should be addressed by more-trained social workers; Law added that she thinks police are overstretched as it is. “We need more sympathy, empathy, compassion and justice in this world, which is why I’m here today,” Law said.